Founded in 2001 following the drive of four municipalities acting as one community to revitalize their neighborhoods and to develop an arts space designed to support artists' living and working, the Gateway Arts & Entertainment (A&E) District in Prince George's County is a safe, vital, and attractive mixed-use environment that celebrates the diversity of art and entertainment that exists in the two-mile corridor. Visit our Vision page for about our community's character, our maps, and bookmark our Frequently Asked Questions. 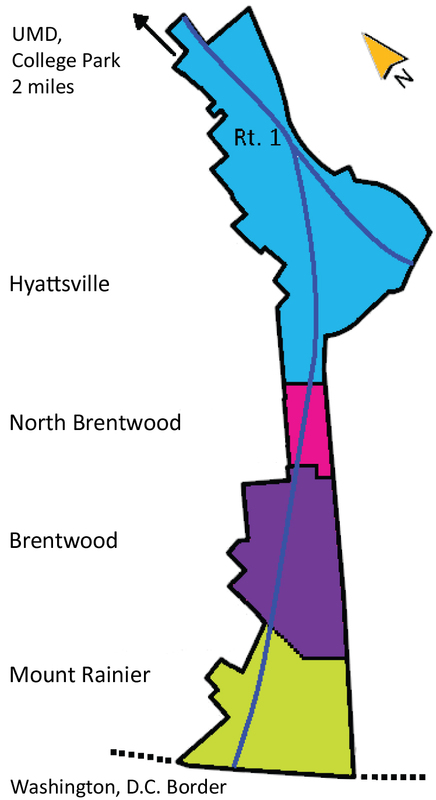 The Gateway Arts District is comprised of the four municipalities of Hyattsville, North Brentwood, Brentwood, and Mount Rainier along Route One. As such, there are four layers of information to be clear on when speaking of the "Gateway Arts District:"
(3) There is the misconception due to the private development that capitalizes on the (Gateway) Arts District with their name "Arts District Hyattsville;"
(4) And finally, there's the Gateway CDC, a non-profit serving the towns of North Brentwood, Brentwood, and Mount Rainier. The Hyattsville CDC serves the City of Hyattsville as well as its surrounding service area, including the Gateway Arts District. Thus, for instance, while many refer to the "Hyattsville end of the Arts District," referring to the Arts District Hyattsville private development; or call the Gateway CDC or the Gateway Arts Center "Gateway," none of these are the "Gateway Arts District." They are independent entities. To recap, the Gateway Arts District refers to the Arts & Entertainment (A&E) District, which runs along Route One (Baltimore Ave./Rhode Island Ave.) from Oglethorpe Street to Eastern Avenue, and features well-known anchors like the Arts District Hyattsville private development, the Prince George's African American Museum & Cultural Center, the Gateway Arts Center managed by Gateway CDC, and the Mount Rainier Artists' Lofts managed by Artspace. Each anchor belongs to a character area defined in the County Gateway Arts District Sector Plan, a blueprint for development standards that build upon our shared vision. To view an online map with these character areas overlaid with an outline of the A&E District, see our maps page. Lastly, the Gateway Arts District is managed by a Management Team.